OK, here’s the deal: Halloween is on a Saturday! Obvs this means costumed Kidical Mass! And hitting some neighborhood business trick-or-treat events. And voting (as in #bikethevote, not a costume contest–everyone’s a winner when it comes to biking in costume!). Saturday, October 31st, 1:30 p.m.
Start your day as early as noon for the 2015 Hunger Goblin/Phinneywood trick-or-treat event that benefits the VOAWW Food Bank. All businesses with Hunger Goblin flyers in the windows will have treats for kids, as well our buddies at G&O Family Cyclery who didn’t have a flyer last I checked. Bring $2 or a can of food to donate at one of the VOAWW boxes along Phinney and Greenwood Avenues and receive an awesome Hunger Goblin sticker! 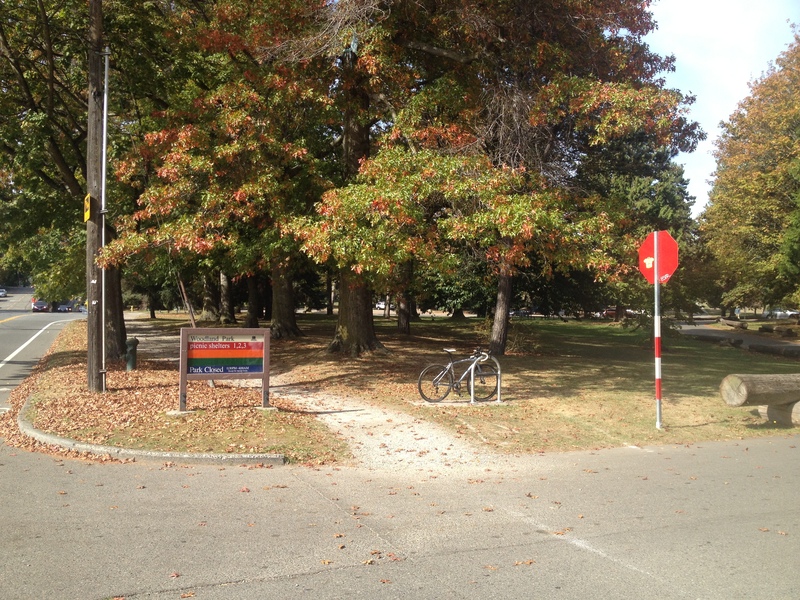 So trick or treat for an hour and a half and then convene in front of the Greenwood Library at 1:30 for THE COSTUME RIDE. We’ll parade 2.8 miles from the Greenwood Library to the Ballard Library and those of us who have ballots will drop them in the ballot box for an awesome, costumed, photo op! Then we’ll continue the parade into Fremont for Trick or Treat in Fremont, the biggest neighborhood business event, with over 150 places participating! It runs 3-6. Note: Sunset will be 5:53 p.m. in case you want to time things to arrive home for trick-or-treating in your own ‘hood at “go” time (which I imagine will be 6:00 p.m.). We live in Wallingford and I hope we can make it to the Wallingford Center before 5pm for their Wallingford Center Halloween Trick or Treat which is also having a food drive, to support FamilyWorks. Here’s our route (except no jog off the 58th Ave Greenway at 15th as suggested by Google Maps–we stick to the Greenway there and back, woo hoo Greenway!). It’s a one-way, 5.8-mile ride, but if you need to get back to the start point or any other spot, please check in for route advice or for assistance in finding other families heading your same way. 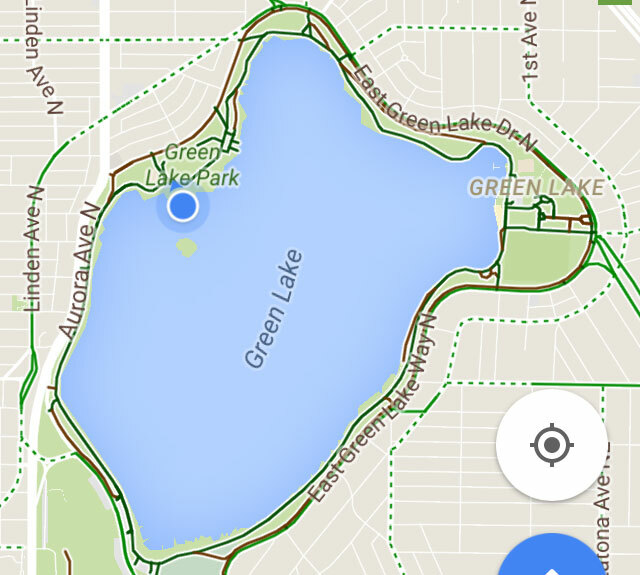 Personally, I’d take 6th Ave NW (a proposed Greenway) back up, were I to head back to Greenwood. NW 75th Street is the first street I’d dare take towards the east to crest the ridge. Costumes are not mandatory! Please come ride, even if you don’t dress up. If Seattle is going to reduce traffic fatalities and build out its bikeway network, it needs to pass the Move Seattle Levy on the ballot this Fall. Cascade strongly supports the levy. Cascade and our Connect Ballard team would like to see the funding for Ballard Bridge maintenance, seismic retrofits and long-term replacement study to be retargeted to near-term solutions for the safety of people walking and biking across the bridge. In addition, Cascade supports an increase and prioritization of Safe Routes to School funding for schools where more than 50 percent of the students are in the free and reduced lunch program. 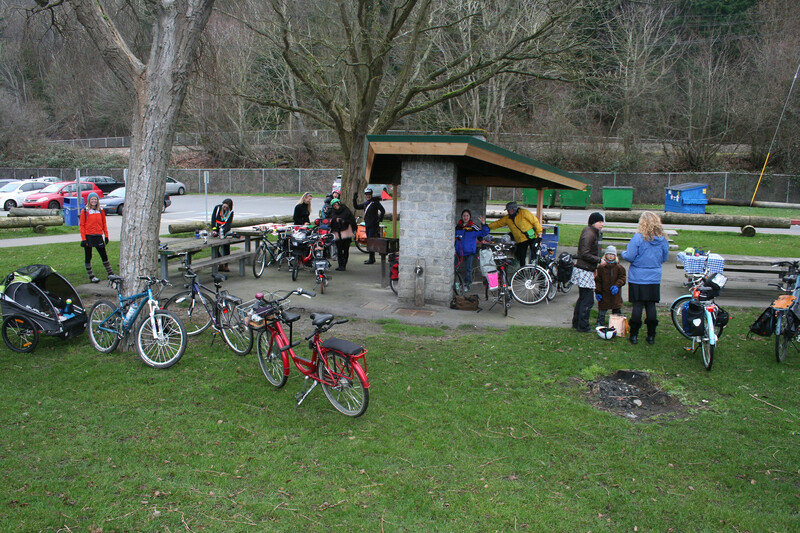 This is a Cascade Bicycle Club Free Group Ride and all participants are required to wear a bicycle helmet and sign a waiver. 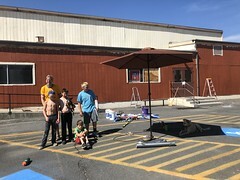 Flying Bike is conveniently located a block away from G&O Family Cyclery which opens at 10am if you need bike stuff or train table time before the ride. I know many of you are more familiar with this area than I (we’ve only biked to Swansons a few times) so if the other side of the graveyard is more interesting–or if it’d be safer to stay on Mary longer and hit Swansons from the north–please let me know. Psst…I happen to have insider information on the theme of this year’s holiday model train. Ask me at Flying Bike and I’ll tell you. It’s a good one! Maybe we’ll repeat this ride in six weeks for the Swansons Reindeer Festival if there’s any interest. 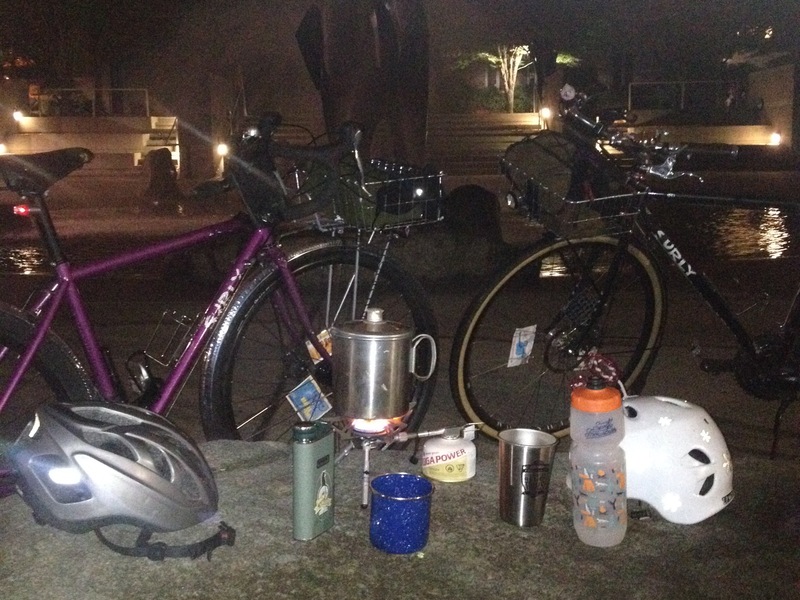 Apologies in advance for causing confusion talking about #coffeeoutside during #coffeeneuring. Coffeeneuring is a seven-week challenge during which one must get coffee from seven different coffee shops, by bike, and document it. New last year (I think) saw the addition of the “Coffee Shop Without Walls” rule which means one can #coffeeoutside during #coffeeneuring. Coffeeoutside is making coffee outside, by bike, documentation optional. 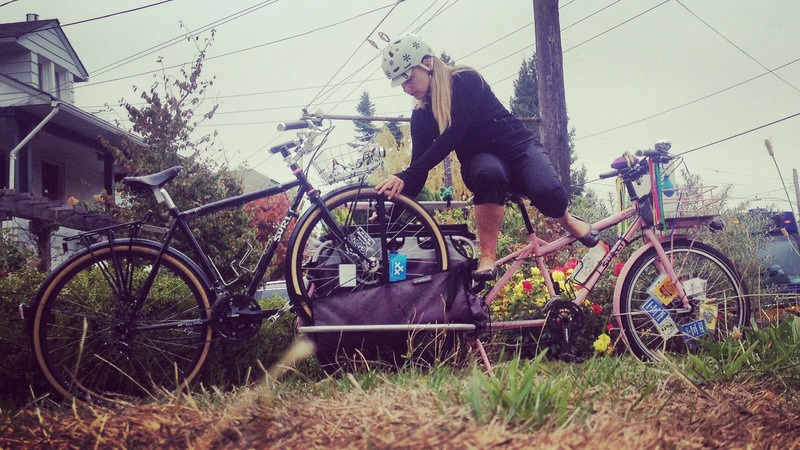 Watch this cool video by The Path Less Pedaled for a taste. And look, there’s my friend Kelley! And Shawn of Urban Adventure League! #CoffeeOutside – PathLessPedaled.com from Russ Roca on Vimeo. I have no idea where #coffeeoutside originated. Feel free to tell me in the comments. I think Rob of Ocean Air Cycles was an early adopter. Most people think of him as a bike builder, but I think of him as the family biker with the world’s coolest-looking Burley Piccolo trailer bike. I particularly love his photos because he’s in Ventura, neighbor to my hometown Santa Barbara. 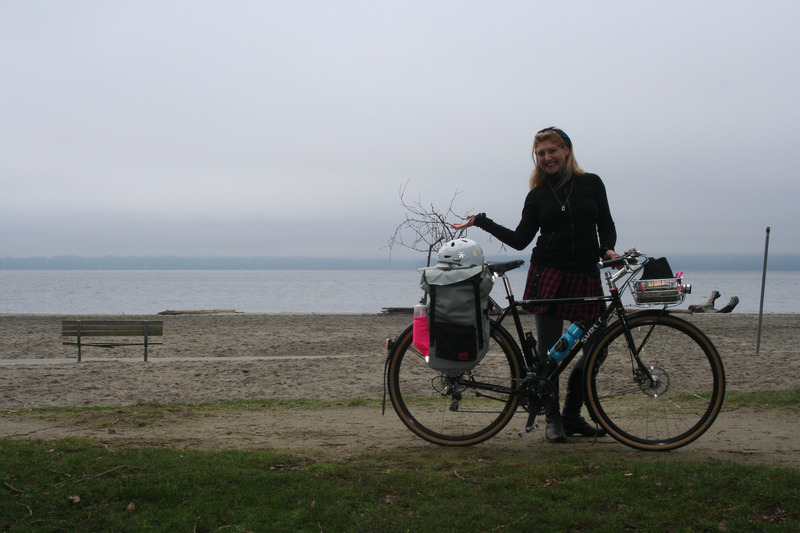 My own #coffeeoutside journey started with #coffeeoutside with Critical Lass last January. Twenty foolhardy women shivered at the beach with me while we ate snacks and made coffee. 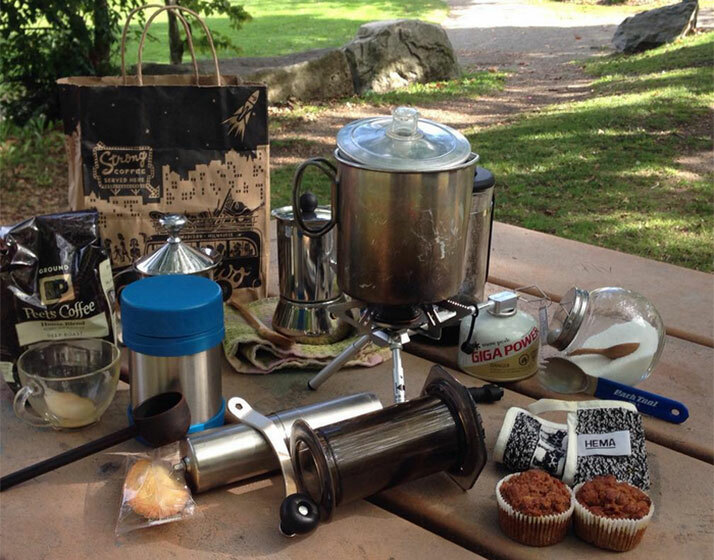 More #coffeeoutside happened during our many camping trips this summer. After three years of just one bike camping trip each summer, I made it out six times this year–as well as a four-day camp for Spring Break. And now we launch #coffeeoutside: For Her. Two weeks ago three friends and I dropped our kids off at school and met by bike at a nearby playground picnic table for a lovely morning of coffee and snacks. I’m not very good at the whole self care thing, but *this* was *that*! I see what all the fuss is about now. So fun. Last week there were just two of us. Still fun, on a pier in Green Lake. 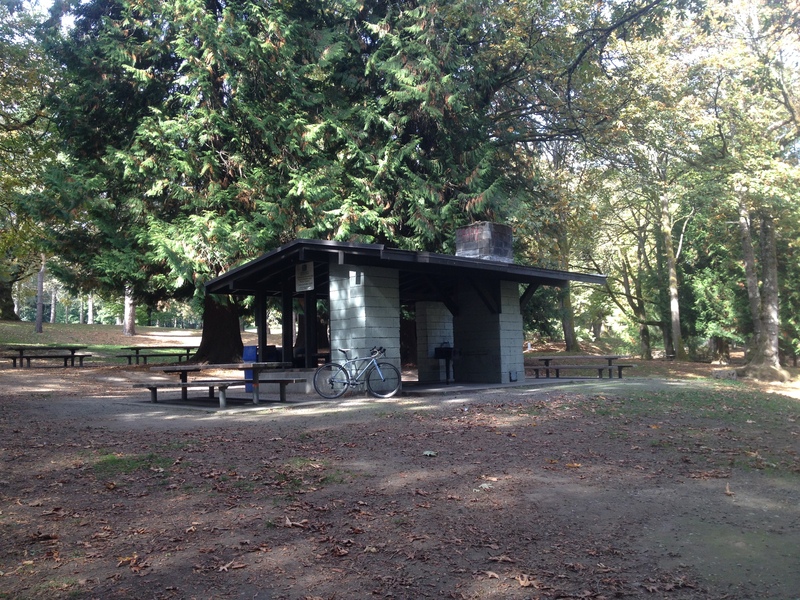 I did a bunch of recon this morning and have chosen this week’s spot–a picnic table west of the Green Lake Bathhouse. So join us on Thursday! 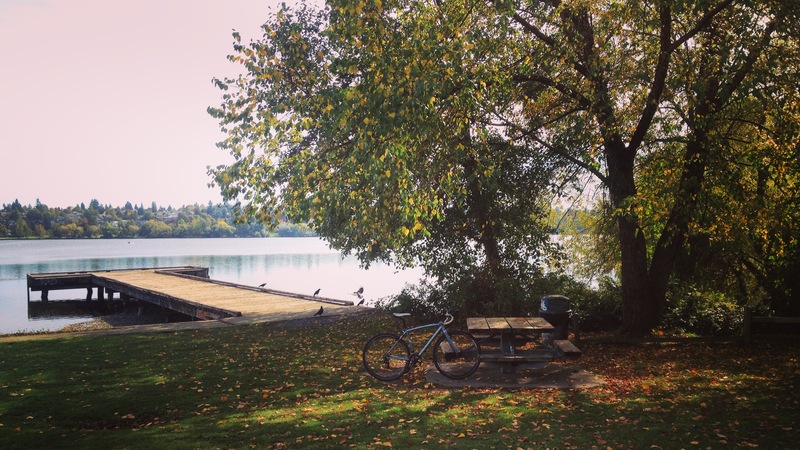 I’ll probably only bother to advertise future #coffeeoutside events on my Instagram since that’s what jdgesus does for his Wednesday 7am Madrona Park #coffeeoutside (I made it to that one once; it was fun!) Bring a coffee cup and if you have coffee-making stuff and coffee, bring that, too. But I’ll have my stove and lotsa coffee if you just want to roll up with a cup. And I’ll probably even have extra cups just in case. And no, you don’t have to be a mom and have just dropped your kids off at school. You don’t even have to identify as female. Nor arrive by bike. We wouldn’t dream of turning anyone away. This won’t work as well once the weather turns so I also checked out the seven picnic shelters in Woodland Park (this stuff is all just “notes to self” for future reference, btw). Shelter 7 is the cutest by far, but there’s no running water and lots of broken glass. Shelter 2 is the best of the bunch and I think will become our regular spot. I had previously decided what makes a perfect #coffeeoutside spot is 1) running water, 2) shelter in case of rain, 3a) alongside water or 3b) gorgeous view…which usually means up a big hill. 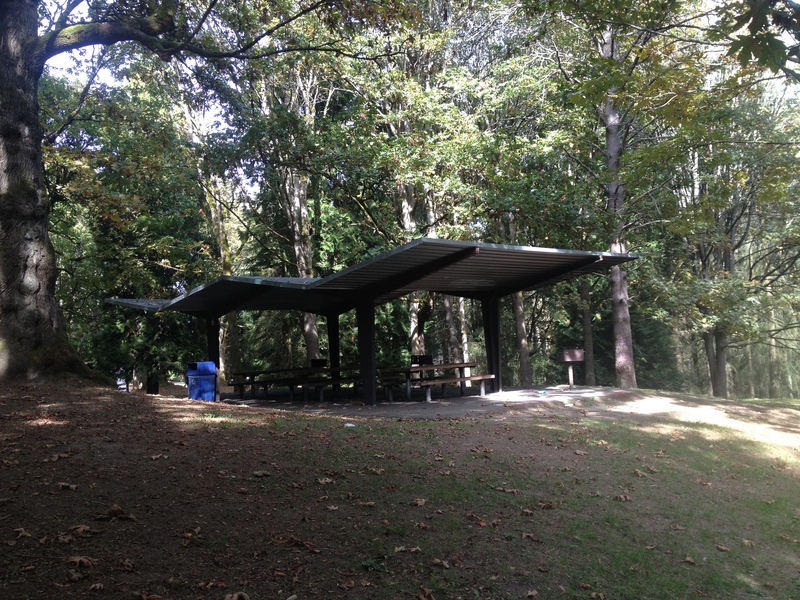 But after seeing our picnic shelter pickings, I’m adding 3c) amongst trees. This week’s spot is a short walk or ride to the Bathhouse Theater for water so it’s not ideal, but with the nice weather we’ve been having, I want to sit in the sun by the lake. I’ll try to recruit Thursday’s attendees to overthink this all with me and find the bestest future spot possible. September was a quiet #30daysofbiking month, but good practice for the real deal next April. I had more instances of just riding up and down the street in front of my house than in any previous round of 30 Days of Biking, but any little bit of riding counts and it’s pretty fun to creatively squeeze a bike ride at the end of the day. We’re dogsitting and took our borrowed doggie to the Labor Day Cargo Bike Ride. She’s used to riding in a bike basket and running alongside a bike so she had fun and we’re having a blast having a dog in the house again after losing Bettie a year ago. We took part in Kidical Massive, all the Kidical Masses leading a family bike on the same day (September 19th) and it was huge: 221 participants at our ride during Ballard Summer Parkways! So on the last day of 30 Days of Biking, I bagged-and-dragged for what may possibly be the last time! I stuck my Surly Straggler on the Surly Big Dummy and pedaled down to drop the Big Dummy off to Haulin’ Colin’ for a two-bike fork-mount tow hitch. I can’t wait!! Now if you’re into online biking challenges and are sad that you have to wait until April for the next one, don’t despair! Today marks the start of the Coffeeneuring Challenge. 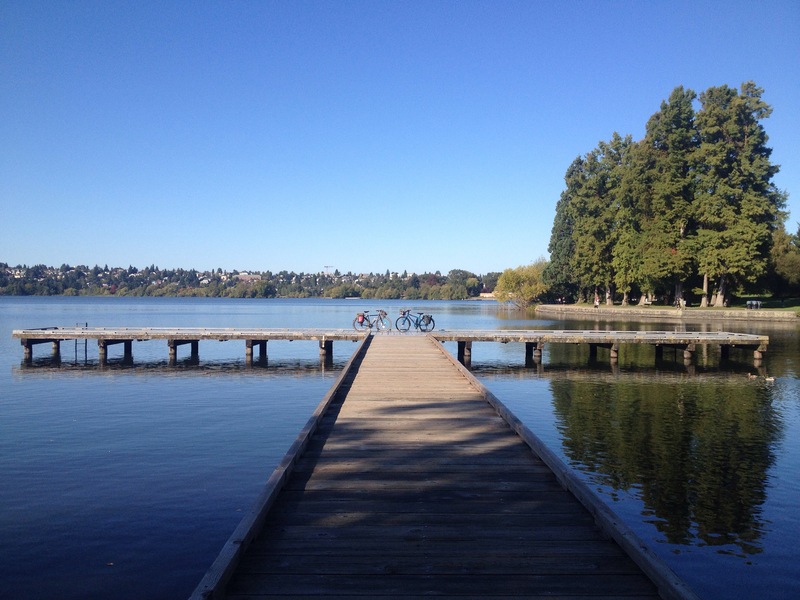 My friend Marley and I kicked it off at the very first opportunity: we set out right at midnight, rode our bikes to Seattle University, chose a nice spot by the fountain, and made #coffeeoutside. I hope we were the first coffeeneurers in our time zone to get to it. I think my coffeeneuring theme shall be “Coffeeneuring with friends” so please let me know if you’d like to coffeeneur in tandem.